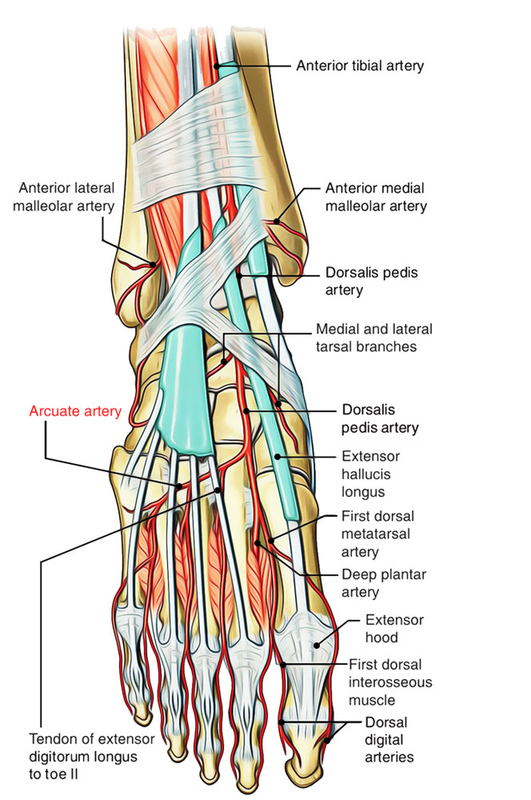 Sections of the dorsalis pedis artery consist of lateral and medial tarsal sections, an arcuate artery, along with a first dorsal metatarsal artery. The arcuate artery travels laterally above the dorsal part of the metatarsals around their bases and also produces three dorsal metatarsal arteries that circulate dorsal digital arteries towards surrounding parts of digits II to V, as well as towards a dorsal digital artery which circulates the lateral side of digit V.
The arcuate artery of the foot (metatarsal artery) emerges via dorsalis pedis a little anterior towards the lateral tarsal artery, particularly above the naviculocuneiform joint, after that it goes lateral ward, above the bases of the lateral four metatarsal bones, below the tendons of the extensor digitorum brevis, its course being affected by its place of origination and it ends within the lateral tarsal artery. It interacts with the plantar arteries via the perforating arteries of the foot. It produces three dorsal metatarsal arteries (second, third, and fourth), each of which splits within two dorsal arteries for the lateral four toes. The lateral one sends a branch towards the lateral side of the little toe.